Australia has long been involved in the secrecy surrounding the nuclear industry, and still is today. It started in the early 1940s, as Australia supplied uranium for the nuclear weapons of America and Britain. From 1952, the UK’s atomic weapons were tested in South Australia and Western Australia. Secrecy has been a top priority, not only for those tests, but also for the effects on the soldiers involved there, and the aboriginal and non-aboriginal communities affected. Australia’s Atomic Energy Commission was set up in 1953, with the purpose of developing nuclear power, and the later option of nuclear weapons. In the 1960s and ’70ssecret military bases at North West Cape, Pine Gap and Nurrungar tied Australia to the US nuclear war-fighting machine. It is generally accepted that the CIA engineered the dismissal of Australia’s Prime Minister, Gough Whitlam, due to particular concern of the USA government to keep Australia in the dark over these bases, particularly Pine Gap. In America, Christopher Boyce was gaoled as a traitor, 1n 1977. He alleged that the CIA had engineered Whitlam’s downfall and had not honoured the 1966 agreement to share the military information gained at Pine Gap. 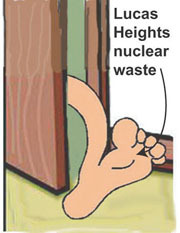 Nuclear secrecy is essential – both in times of war and in peace, for obvious security reasons. But the secretive origins of Australia’s nuclear involvement set the pattern for the industry. Today, the operations of Pine Gap remain secret. The Australian government’s Atomic Energy Commission, has been transformed into Australian Nuclear Science and Technology Organisation (ANSTO). ANSTO masquerades as some sort of medical research operation, under its spruiker, Ziggy Switkowski. Switkowski pitches nuclear power as a necessary and viable industry, and conceals both the connection to nuclear weapons, and the increasing development of renewable energy overseas, especially in Asia. 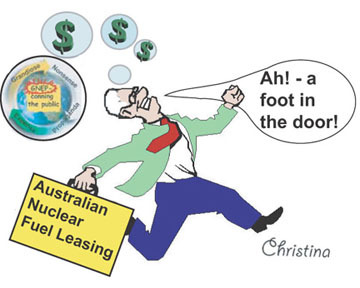 Australia’s mainstream media participates in the secrecy over uranium and nuclear power. The revelations by Christopher Boyce, in 1982, were not covered. The involvement of Australia in the International framework for Nuclear Energy Cooperation, with its obligation to take back nuclear waste, is never publicised. The issue of nuclear waste is deliberately clouded by the Australian government, and plans to dump nuclear reactor waste at Muckaty, on Aboriginal land, are portrayed as a “medical necessity”. With the USA in turmoil over its mounting nuclear waste problem, Muckaty is very likely to be the way in for Australia to once again oblige America – this time by importing its radioactive wastes. Nuclear discussions will be held between Australai’s Prime minister, and USA Secretary of State, Hillary Clinton , and probably Barack Obama, – but you can bet that this will involve secret negotiations,. When it comes to the uranium industry, Australian government policy is pretty much in the hands of uranium mining’s big cheeses – Don Argus, Marius Kloppers. In government, Energy and Environment Ministries are run by mining advocates, Martin Ferguson and Greg Combet.